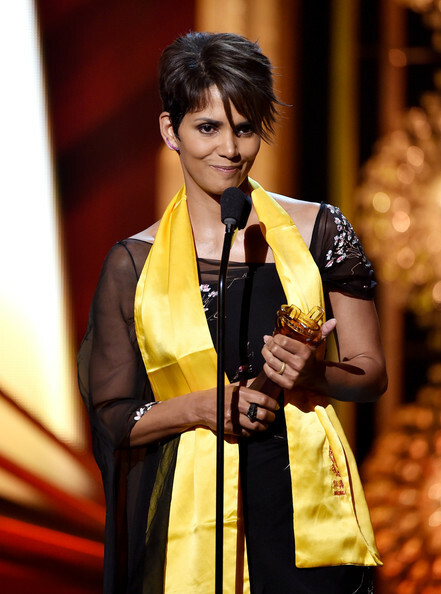 *Halle Berry was among the honorees in attendance at China’s equivalent of the Oscars, the Huading Awards, held for the first time in the U.S. at the Montalban theater in Hollywood on Sunday night. The live telecast reached more than 800 million viewers in China, Hong Kong and Taiwan, where 80 million fans voted for the best in the film industry, according to The Hollywood Reporter. Berry was named best global icon at the ceremony. Though she didn’t talk to the press, Berry did say a few words upon receiving her award, calling to mind her visit to Shanghai a few years ago and the warm welcome she received from Chinese fans. Orlando Bloom won for best global actor icon, and filmmaker Guillermo Del Toro received the best global director award. Bradley Cooper was voted as best global actor and actors Jordana Brewster and Tyrese Gibson accepted the best global movie award for “Fast & Furious 6” in memory of Paul Walker. Zoe Saldana was recognized as best global supporting actress and Jeremy Renner was awarded best global supporting actor. Composer Hans Zimmer was presented with the lifetime achievement award for his motion picture scores. Hosted by actress Lucy Liu and Chinese television personality Olivia Xu, the show featured performances from Jabbawockeez (winners of MTV’s America’s Best Dance Crew), the Shaolin Warriors, The Voice China winner Summer Jikejunyi, and magician Master Zhao. While the Oscars this year rose to 43.7 million viewers, the Huading awards reaches one of the largest audiences celebrating the achievements of many prominent American entertainers with an additional 400 million watching online.